An open office layout can guarantee you some benefits! The hyped open office layout was comparable to a Feng Shui movement of the 1970s; the fixation of “HR gurus” and “business culturists”. Leaders, regardless of what industry, thought that this disruption of the long-reigning, autocratic cubicle would lead to Facebook and Apple levels of innovation and creativity within their own companies. It’s Millennial, guys. Fun. It’s collaborative and democratic! It has to work! Putting everyone in one room as the answer to lack of communication and collaboration is starting to be more of a business myth. It can help, there are good things that come from it, yes. But there is so much more you have to get right as well and it is, in fact, possible without the open office space. Easy, relevant, real-time communication is great for building on each other’s ideas and making fast decisions. Everyone being in constant presence can build engagement and an egalitarian rapport between management and employees. For those that were on trend, employees and managers are finding they hate more than they love about their open offices. Noisy, distracting, and lack of privacy have been some of the biggest complaints. According to recent studies, the average adult attention span has dropped from 12 minutes to just about 5 for speeches or meetings. Correspondingly, the benefit open office layouts bring is the ability to “meet” in short, sporadic, and most importantly, concentrated moments to make decisions and get feedback on ideas quickly. It makes things happen, unlike lecture-like meetings where roughly 73% of your staff are working on something else anyways. As a result, implement little practices like Ethan McCarty’s 15 minute “stand up” meetings once or twice a day. You know what’s cheaper than wall demolition? Chat platforms. And there’s plenty to choose from. Mimic open office communication and give your team technology for immediate, brief conversations. The personal and intuitive dynamic of team chat helps increase employee engagement (while keeping privacy) which can boost productivity by 20–25%. Consequently, office chat platforms are great for the quick, creative banter that fosters innovation. However, just make sure chat is actually productive and not an endless feed of GIFs. 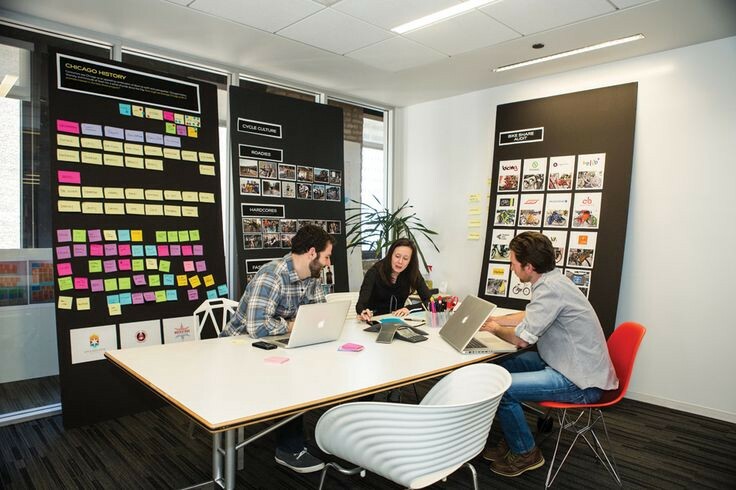 First off, take a page out of legendary innovation holy ground IDEO design school’s playbook. Employees who feel their company has a good balance between individual and collaborative work are 36% more satisfied with their jobs. To do this, reserve a shared space strictly for free-flowing, highly visual collaboration on a new project in your office. Maybe it’s simply a wall, a spare room, or table. Additionally, work to instill a habit of shared creativity by setting aside 30–60 minutes each week to meet here together to brief inspiring news or share new ideas. Rather, leave employees to arbitrarily meet here to collaborate on projects. Maybe use a meeting space scheduling app like YArooms to keep organized. Collaboration can’t happen if everyone is splitting up work or when no one has quiet to concentrate. In conclusion, find a happy balance. Maybe you don’t have to call in a demolition team or start building IKEA co-working desks to get an open office layout. Rather, just give these three strategies a try.